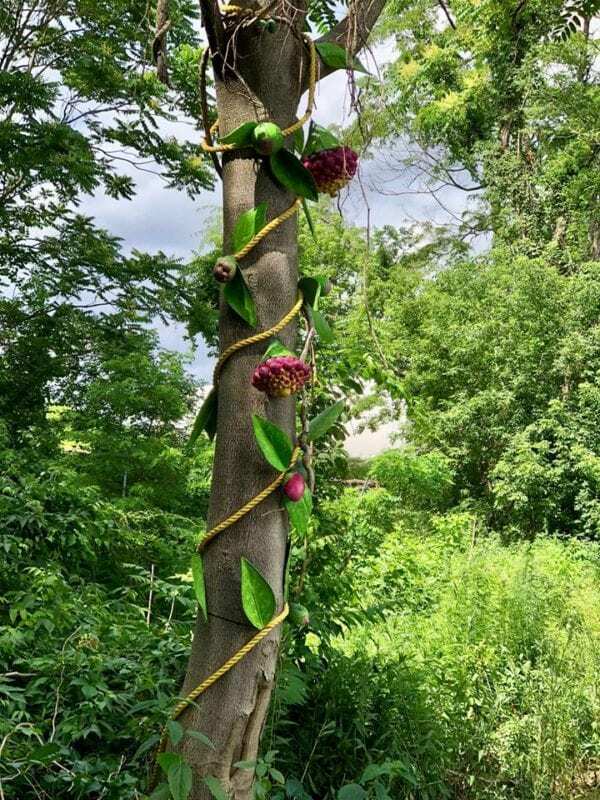 Everyone’s invited to the Upper Falls Greenway (at Oak and Chestnut St) on Monday at 5:30 PM to kick off a two month long exhibition of art up and down the Greenway. 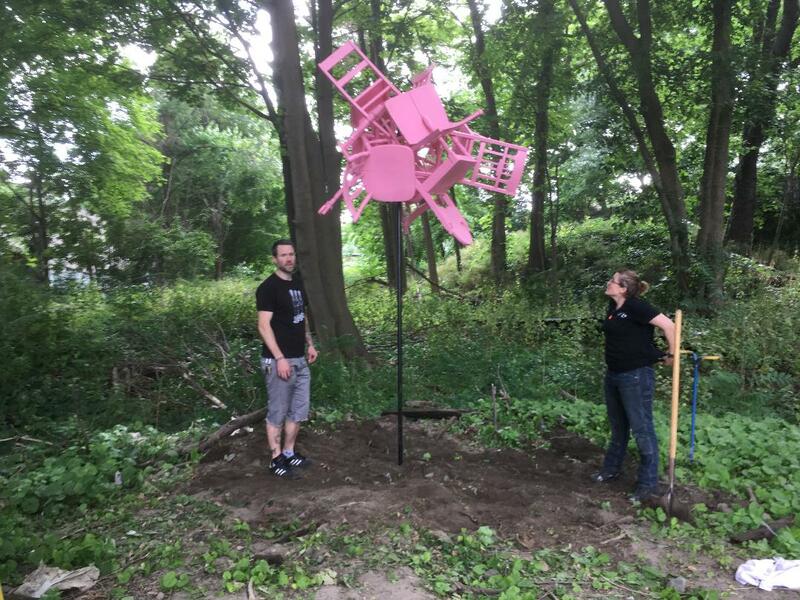 “Beyond Borders” is an outdoor sculpture exhibition that is the work of N2 Innovation District, in partnership with Studios Without Walls and the New Art Center. Mayor Fuller will be on hand to help kick off the festivities. We have music at the street piano, giant puppets on the loose, and the artists on hand to give a tour of their work. Come on down for the party on Monday evening or go for walk on the Greenway anytime over the next two months and discover it yourself. Also – special shout out to the Parks & Rec. Department. Public art on city property is always a complicated thing. This project got sprung on the Parks & Rec Dept with not too much warning and they jumped on it make it all happen. We love that. An excellent spot for this exhibition. And looks like a great day for the event. I took a walk through yesterday and these are some beautiful pieces. I love how they pull you into the landscape and force you to examine the area in a whole new way. We have a map of the artwork here so you can be sure to find everything: http://www.n2innovationdistrict.com/greenway-arts. I was there yesterday and talked to one of the artists while she was working on her piece. What a wonderful idea! Great crowd, perfect weather, and lots of fun – what a perfect way to kick off this exhibition. A special shout out to Shogun, a local artist that lives a block away. He got wind of this project over the weekend when the art started going up and jumped in with both feet. 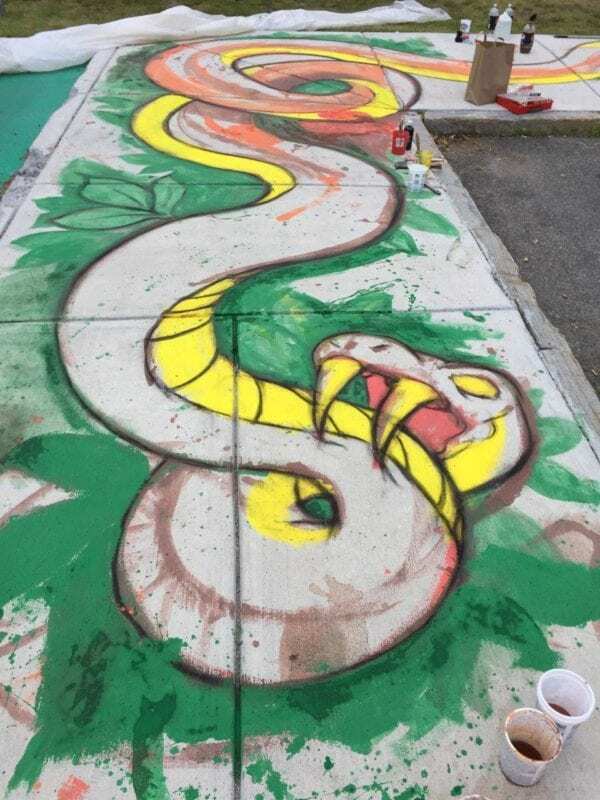 He used a big hunk of the Chestnut St sidewalk as his canvas to unfurl a snake,. I particularly loved that he incorporated a tribute to his new friend Carol Stapleton from Newton’s Park & Rec. “Carol is my [heart]”. Thanks to all the artists, the sponsors and organizers for turning the Upper Falls Greenway into an open air gallery for the summer. Thanks for the great pix Joshua. Here’s a late addition that you may have missed.